St. Patrick’s Day is just around the corner and I’ve got a great new recipe to celebrate it with. 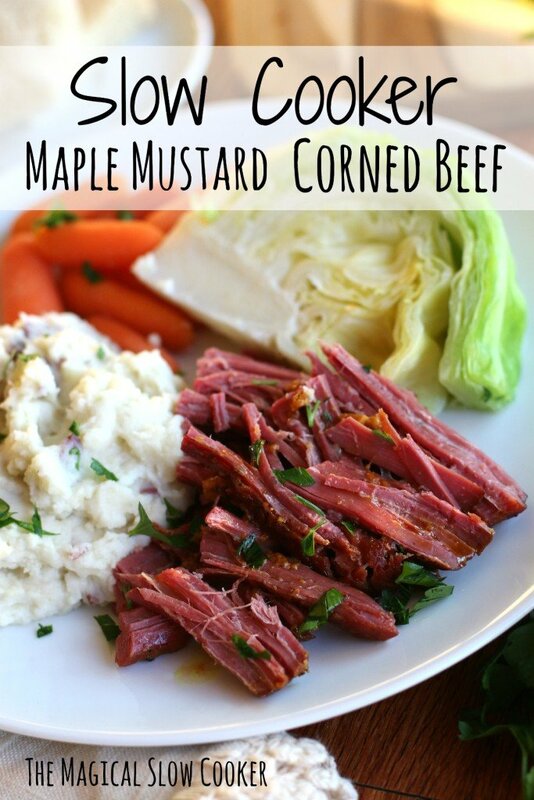 I made a Slow Cooker Maple Mustard Corned Beef. It turned out perfectly flavored and tender. I served up this beautiful piece of meat with mashed red potatoes, steamed carrots and cabbage. I also made homemade bread in my bread maker, my other favorite kitchen appliance! For the last few years I’ve made a standard Corned Beef and Cabbage. Though that meal turns out great, I really wanted to step this meal up a notch. First thing I did different was I ditched that pickling seasoning packet that comes with the corned beef. When I created this recipe I had originally mixed in that packet in with the mustard and maple syrup, I gave it a taste and poured it down the drain. This was the first time I’ve cooked a corned beef without the pickling packet, and I have no regrets! I could taste the true flavor of the meat, and I didn’t have peppercorns popping in my mouth. The other thing I did different this year was I made mashed red potatoes, instead of steaming the potatoes with the meat. The entire meal tasted like we were dining out at fancy restaurant on St. Patrick’s Day. Pat the corned beef dry with a paper towel. Sprinkle the corned beef with pepper. In a small bowl mix together the maple syrup, mustard, pepper, and garlic clove. Pour this sauce over the corned beef in the slow cooker. Serve with desired sides, I made mashed red potatoes, steamed carrots and cabbage. What to do with the leftovers? 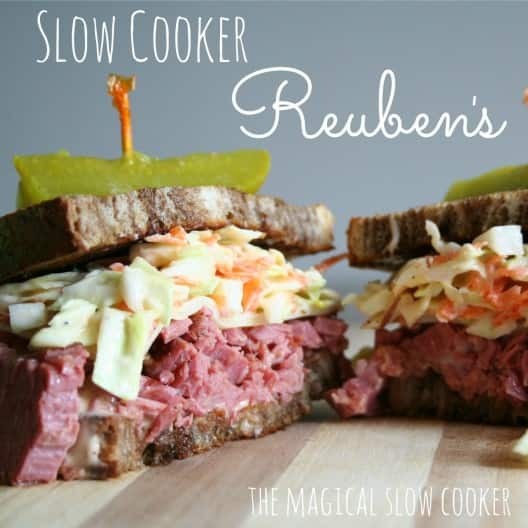 Make these Reuben’s! I have been craving corned beef. Love your combination of maple syrup and mustard. This is going to have fantastic flavor. We were hosting our wine club dinner tonight. Tried the recipe a week ago, and thought it was great. Served it tonight for a very discerning group, and got nothing but outstanding comments! And by the way, goes well with a medium off-dry Riesling, Burgundy Cote Chalonnaise, and a good Beaujolais!! Thank you for the review! I’m glad you enjoyed it. I like the idea of mashed potatoes with the corned beef. 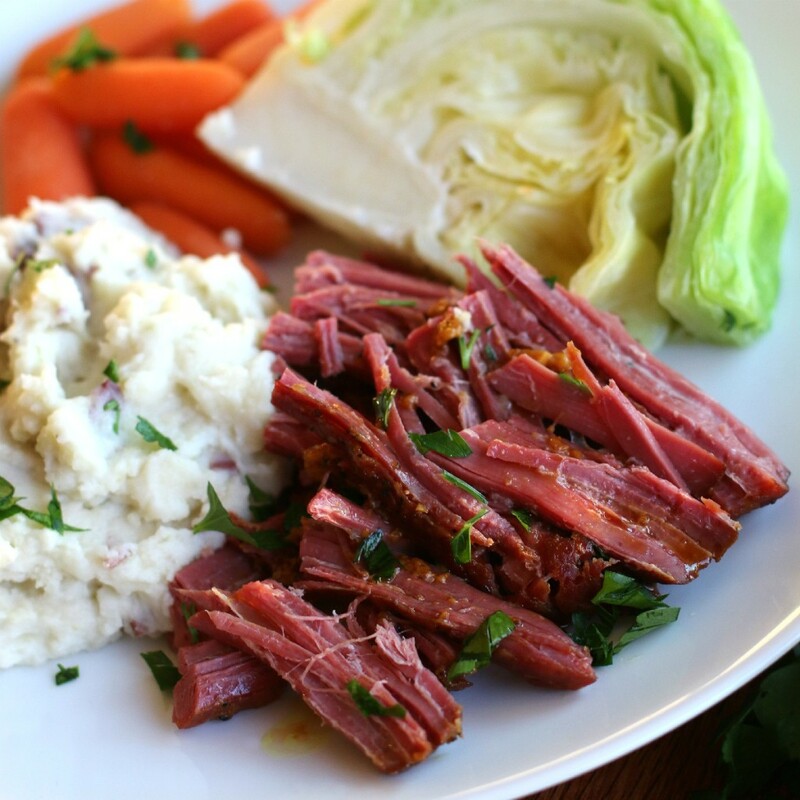 I make corned beef and cabbage exactly once a year (haha) and I always make it in the slow cooker. I love how tender it cooks up the meat! I’ll have to try your flavorings on mine this year. Wow this looks sooo tasty! Yum! this will be perfect for st patty’s day! This sounds delish! Did you use brown or yellow mustard? Thanks. I was looking for reviews to help answer that question. This looks absolutely wonderful!! I have to pick up a corned beef and try this out! I love corned beef! I think I’ll try this recipe for St. Patrick’s day this year! 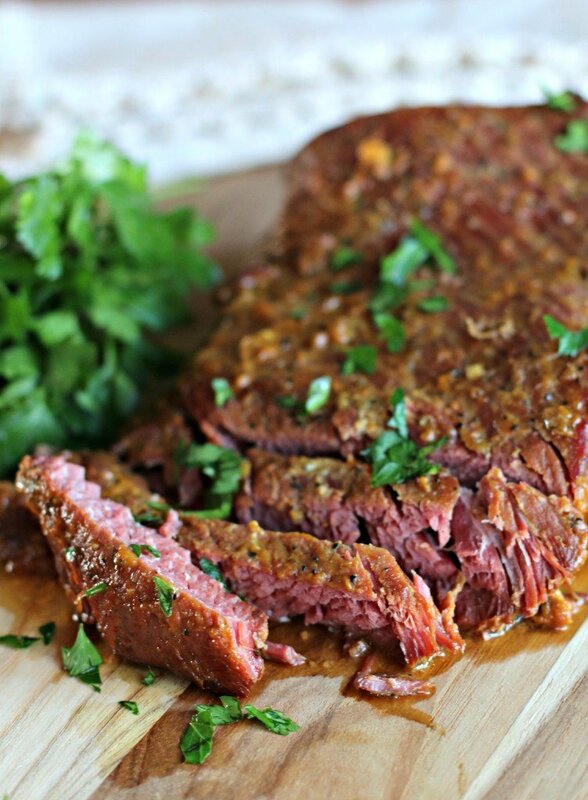 This corned beef sounds fantastic! I love how easy it is to prepare! could you please tell me which part of the cow you call corned beef? I live in France, love your recipes but don’t know what to buy at the butcher shop to make this delicious looking meal. Thanks!!! Why don’t people comment AFTER they have made the dish? Seriously! Before I waste a meal and time. Why don’t YOU? Do you expect someone else to do your experimenting work so you don’t have too? Get a life, freeloading bum!!! This is the second year in a row I’ve made this, this is SOOOOOOOOOOOOOO good!!!!!!!!!! When making this is there liquid in the crockpot during cooking? I wanted to try something new with a chunk of pre-seasoned corned beef (no packet, unfortunately, so I just rinsed well and hoped for the best). Came across your recipe and gave it a try! We have no slow cooker so I used our cast iron pot in the oven, I added some ponzu we had a little bit of and it turned out awesome! As others have mentioned, it’s a good idea to boil the corned beef first and pour off the water, unless you really like it salty. I just made this recipe last night, and it was excellent. I also used a point cut, rather than a flat cut, because the point has more fat. More fat = more marbling, which means more tender and more flavor. The flat cut gives nicer slices, but I’m cooking corned beef for flavor, not presentation. I made this recipe on St. Patrick’s day and followed it exactly. We made it for Ruebans. People are still talking about those Ruebans. I will be using this recipe exclusively from now on. This is what is for dinner tonight! I liked the comments above ( and of course read about boiling the meat first after I already put it into the crockpot). I will come back and comment again after we eat it. This is a dry run for Christmas dinner. We are already talking about the corn beef hash for breakfast morning. OMG!!! This was great! So easy to put together and the family loved it! It made the cut and we are using it for our Christmas Eve potluck Open House. We even had the Corned Beef Hash for breakfast this morning. We are looking forward to Christmas Morning breakfast! I am thinking ‘Corned Beef Hash Eggs Benedict’! 1. I started too late to do seven hours on low, so I did 5 1/2 on high and it came out perfect. 2. I did not boil the beef first, and it was not too salty. We discussed it over dinner and realized it was fine just throwing it into the crockpot after searing. 3. There seem to be a lot of liquid at the end. Any thoughts on what to do with it? Or, did you just throw it away like we did? Thanks again, this is a definite keeper! Sarah, Our numbers just went up to 23, would you ever put two corn beef’s into a crockpot? I don’t want to change the menu, but I don’t know what else to do? Suggestions? You could do two, I don’t see a problem. Keep the lid on the entire time, you probably should cook and extra hour. Just to clarify others comments – it’s a good idea to boil before searing, but for how long? Nope, the maple syrup and the mustard was enough liquid. Though if you are cooking longer than 7 hours I would add a splash of water. Holy cow, literally! This recipe is so delicious. I followed the recipe and served it with golden potatoes and asparagus. I buy a low salt corned beef at the grocery store – for those of you who thought it was too salty or want to boil first. I made this recipe last year & it was the only good (really GREAT) corned beef I had made in years! I had given up making it for St. Paddy’s Day but not anymore! I’m going to borrow my son’s crockpot so I can make two this year to feed everyone. rebecca from Australia has tried your yummy corn beef. Slow cook recipe. It is only fair as you have shared your recipe with me… that I share my easy sauce to go with your meat. Place in a pot on the stove medium heat, butter, sugar, mustard and vinegar. Remove fro hear stir in the corn flour til smooth. Return to heat and add alll other ingredients while stirring constantly. Once thick enjoy with Sarah Maple Mustard Corn beef. Thank you so much sharing that. I will try it! Sounds great. Ok, I made this recipe today. I have only made corn beef once before. This recipe has good flavoring but now I know you must always boil a corn beef first because it is so salty. So my suggestion is boil first to cook off salt. Then apply this recipe. Perhaps, boil for a few hours and then put in crock pot. Maple, mustard, garlic, pepper flavoring was great just needs to be boiled first or it will be vey salty. Great tip, thank you! I haven’t wanted corn beef in a while since it can be salty. I may cook in in the crock pot half the time in water, then add the seasonings. Ok so sounds like the concensus is to boil first before applyîng the recipe. Does that cut down on the cooking time in the crock pso it is not overlooked. I do not love overly salty food.